Protecting hedgehogs this November 5th! Coming into autumn and winter, many hedgehogs begin to look for a suitable place to hibernate. A place that offers shelter, darkness and warmth for an extended period of undisturbed sleep. For the unlucky ones that come upon a towering pile of twigs, foliage and tree branches in a field or backyard, hibernation will last indefinitely. On the 5th November, thousands of families, schools and communities light bonfires in remembrance of the failed Gunpowder Plot. Whilst this is a pleasant occasion for us, many hedgehogs awaken to the crackle of burning wood and the suffocating smoke fumes that signal a fire. 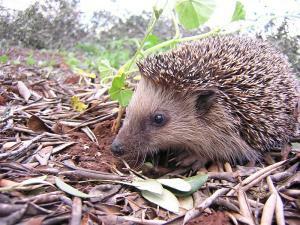 Unable to escape the sky-high bracken and debris that encircles them, most hedgehogs are asphyxiated or burned alive. A tragic and distressing death that is fortunately completely avoidable, not just on November 5th, but on every night of the year when a bonfire might be held. Unbeknownst to most, hedgehog populations are in decline. Intensive farming, loss of food sources and the destruction of habitats are some of the factors contributing to this, and the UK Biodiversity Action Plan considers the hedgehog a species in need of ‘greater conservation and protection.’ But why should we go to any trouble for the sake of a hedgehog? These small, endearing creatures are not just curious things to look at but they help to control populations of snails and slugs – menaces to our growing plants and vegetables. Prepared, unlit bonfires offer a seemingly safe haven for these wandering hedgehogs, which crawl beneath piles of wood and stay there. For convenience, many people assemble a bonfire in advance of the night and this is usually how most hedgehog deaths occur. If only a handful of hedgehogs were spared death this Bonfire Night, and a handful more next year, it would have a significant impact on preserving the species. So how can you go about ensuring the safety of hedgehogs this November 5th? In order to protect hedgehogs and any other wildlife that may have unknowingly bedded down in an unlit fire, here are some simple tips on bonfire assembly and precaution. Firstly, it is important to construct the bonfire as close to the night as possible. This will prevent hedgehogs from nesting in the stacked wood and coming to consequent harm. If it is not practical to do so, enclosing the bonfire with wire mesh or fencing is the best option, whilst a tarpaulin covering will not offer an adequate barrier against hedgehog intrusion. Another solution is to stack the wood and other materials in one area while it accumulates, but assemble the bonfire elsewhere on the night of lighting. Therefore, if any hedgehogs have found their way beneath the pile they will soon be detected when the materials are moved. Even if you have observed these guidelines it is recommended that you check the bonfire one final time, preferably with a rake and a torch, before setting fire to it. If a hedgehog is noticed, remove it gently wearing gloves and transport it to somewhere safe and dry. It might be useful to have a box or enclosure ready if this were to happen, or to provide a suitable habitat for hedgehogs that is close to your bonfire – while this should be moved before lighting the fire, it may help divert hedgehogs from nesting in the bonfire itself. The Devon Wildlife Trust has started a campaign that encourages people to construct refuges for hedgehogs during autumn and winter months when bonfires and fireworks are ongoing. They suggest gathering fallen leaves or lawn cuttings into a pile in the garden, ensuring it is located a safe distance from any potential bonfire or firework display. As well as providing an alternative habitat for hedgehogs during bonfires, you might want to think about how you go about gathering the materials for lighting, as raking and strimming can cause fatal injuries to hedgehogs and other wildlife. Many conservation charities highly advocate leaving food out for hedgehogs during the colder months when they are most vulnerable. Rather than leaving bread and milk, a dry or wet pet food, preferably containing meaty chunks, is most advisable. This will help provide for young hedgehogs and expecting mothers. The most important thing to remember is to keep your eyes peeled. Being aware of hedgehogs and their tendency to make home in bonfires is half the battle and goes some way to saving their lives. This has been a great help - I had no idea of the problems outlined in this excellent article and am circulating it to my database of yoga students and teachers. We do not ever light bonfires, thank goodness, and we do provide hedgehog shelter each year. Sadly we cannot leave wet cat food out since our rescued cat will eat it.